At arrival check in Munnar hotel, freshen up and enjoy welcome drink at the comfort of your room. Afternoon enjoy leisure time at the hotel enjoying the scenic beauty of munnar. Overnight stay will be at the hotel in Munnar . Morning after breakfast, our representative takes you towards Kanyakumari(330 Kms/ 7 Hrs). Kanyakumari is the vicinity where the three great marinades – the Arabian Sea, the Indian Ocean and the Bay of Bengal grapple one another. Kanyakumari is one of the exiguous places across the world where the artistry of both sunrise and sunset can be beheld at the same oceanfront. Rest of the day is at leisure. Later visit to Vivekananda Rock Memorial, Suchindrum, Sunrise point and Sunset point. 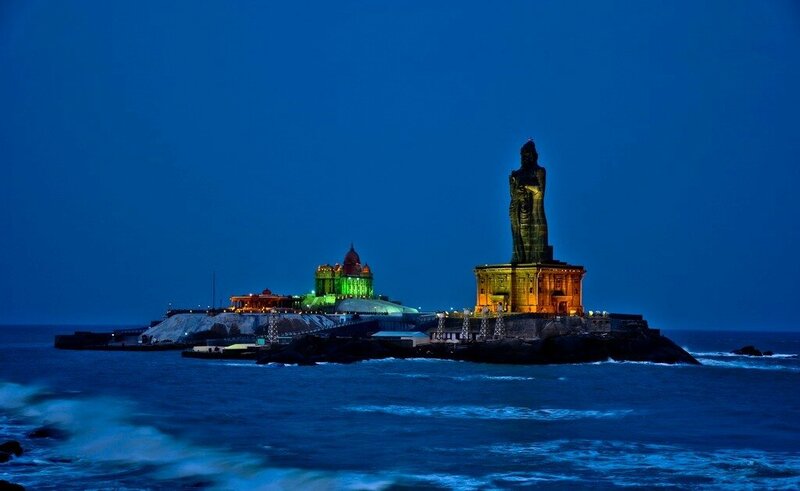 Vivekananda Rock Memorial Situated at the juncture where the Arabian Sea, the Indian Ocean and the Bay of Bengal embrace one another, the Vivekananda Rock Memorial has today become the icon of Kanyakumari. Built in blue and red granite, this memorial is spread over the area of 6 acres. It is perched at the height of 17 meters on a rocky island. It is said that the endeavors of 650 men for nearly 2081 days took to complete this marvel of architecture. The rock island on which the Vivekananda Rock Memorial is towered is the very place where Swami Vivekananda had spent the three days of self awakening. Suchindrum a famous Hindu pilgrim destination is situated nearly 15 kilometers from Kanyakumari town in Kanyakumari District. ‘Thanumalayan Temple’, the most important shrine for both Shaivaites and Vaishnavites is the most renowned religious hub and the icon of the town of Suchindrum. The temple houses the three deities of Hindu Trinity; Brahma, Vishnu and Mahesh together. Later come back to hotel. Overnight stay at the hotel in Kanyakumari.